November 20, 2013 — The International Consumer Electronics Show has named Cub Cadet’s RZT S ZERO, the world’s first fully-electric zero-turn riding mower with steering wheel control and four-wheel steering technology, as an Innovations Design and Engineering Awards Honoree in the Eco Design & Sustainable Technologies category. This is the second award of global prestige for the ZERO in 2013. It also received the coveted Breakthrough Award from Hearst Media’s Popular Mechanics in October. The ZERO is the only fully electric zero-turn rider that is controlled by a steering wheel and patented four-wheel steering technology. This provides incredible maneuverability on all types of terrain and allows for greater straight-line tracking as well as traction and stability on hills. 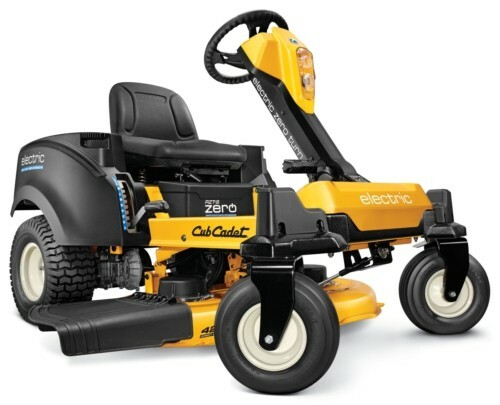 The advantages are immediately apparent with the ZERO’s “no compromise” cutting performance that produces the Cub Cadet Signature Cut that customers have come to expect from the brand. The product is Cub Cadet’s latest achievement in a history of American-inspired innovation dating back to 1961, as well as an extension of the Consumers Digest Best Buy Award winning line of zero-turn mowers. The Cub Cadet ZERO will be on exhibit at the Digital Experience! in Las Vegas on Monday, January 6, 2014 from 7:00 pm – 10:30 pm at The Mirage Events Center (MEC) at the Mirage Hotel. It is currently available in select markets and will be expanded into new markets for spring 2014. 117 Pictures Of What I saw at the 2015 GIE-EXPO For Todays Mower and a Surprise!